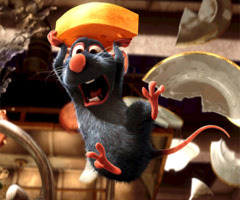 Check the Fien Print: MovieWatch: "Ratatouille"
In a Nutshell: The sense that Pixar was infallible, incapable of producing anything less than a great movie, was taken out to the woodshed by last summer's "Cars." I'm still a wee bit confused by "Cars," seeing as how it was directed by John Lasseter, Pixar's acknowledged mastermind. In the moment, "Cars" was merely disappointing. A year later, I'm hard-pressed to remember a single character, a single line of dialogue, a single moment. That's the kind of disposable entertainment I expect and accept from the animation departments at Sony or DreamWorks. Marketed to the NASCAR Nation, "Cars" was a huge hit. In fact, I have a hard time imagining "Ratatouille" out-grossing "Cars," though I write that with resignation, since "Ratatouille" is a fine bounce-back film for the company. Although much has been made of the difficulties of marketing a movie in which the main character is a rat and the title is unspellable (by me at least) and unpronounceable (by stupid people at least) and the setting is French (who we apparently still hate), "Ratatouille" is tapping the zeitgeist pretty well. The obnoxious man behind me who guffawed through the entire movie and his stupid wife who announced that she'd totally known that Brad Bird was the voice of semi-evil chef Skinner (Ian Holm is actually the voice) saw the poster for "No Reservations" as they left the theater and said, without irony, that the Aaron Eckhart/Catherine Zeta-Jones movie obviously must be trying to capitalize on "Ratatouille" (they seem not to have seen "Mostly Martha). They may have been wrong, but a good argument could be made that food is everywhere this summer and not just on the big screen. I'm recapping both "Top Chef" (actually about food) and "Hell's Kitchen" (actually about Gordon Ramsay swearing at people) for Zap2it and look at all of the news coverage that accompanied word that Kobayashi might duck Joey Chestnut in the annual 4th of July Nathan's Famous Hot Dog Eating Contest (he's decided to fight through his jaw arthritis, last I heard). Food is everywhere and "Ratatouille" ought to be able to captitalize, even if the hero is, indeed, a bit of a rodent. But Remy, anthropomorphized within an inch of his life, is a loveable rodent, a huggable rodent, a rodent who knows the proper sauces to accompany sweetbreads. And the film's message -- "Anybody can cook" -- isn't really about rats or even about cooking. Like so many animated films before it, "Ratatouille" argues that no matter how you look on the outside and no matter how people may judge you, your only limitations are the ones you put on yourself. That's a good lesson for kids, but indeed "Ratatouille" may not be aimed at the smallest of viewers, or at least it lacks the elements that non-Pixar animated films seem to think children require. Unless I'm forgetting, there's no toilet humor at all and only occasional gags based on bodily fluids of any sort. There's amply physical humor, but I laughed more at the wordplay and kitchen hijinx. Other studios may think kids require Robin Williams doing standard ethnic caricatures, but Pixar doesn't. There's a certain strangeness to some of the voice casting, weird bits of Pixar ideology. While DreamWorks and Sony have always had the impression that casting A-list actors to do voice-overs was a good creative and financial decision, Pixar has gone a different direction. Stand-up fans know Patton Oswalt, but he isn't bringing kids to the theater and he's a fine voice. Ian Holm [hilarious], Peter O'Toole [utterly remarkable] and Brian Dennehy have great voices, so you can't go wrong letting them work. But who thought it was a good idea to have Janeane Garofalo doing an off-putting and erratic French accent as leading lady Colette? Total non-actors (and animators) Lou Romano and Peter Sohn do fine with their key roles, but might Linguini and Emile have been funnier if Pixar had gone to a veteran voice artist? I'm not sure. I guess I prefer the Pixar casting method to whatever stuck me with "Madagascar." "Ratatouille" looks phenomenal, doing magical things with both food and Paris. The movie's too long and I kind with Bird hadn't felt the need to articulate exactly why he hates critics. It wasn't our fault "Iron Giant" tanked, Brad. We all loved it! In the Pixar Pantheon, I have "The Incredibles" far up in first. It's a great movie, quite deserving of a place on the AFI Top 100. I place the two "Toy Story" movies in second and third (pick your order). I think "Ratatouille" can go soon after that, ahead of "Bug's Life," "Monsters Inc." and "Finding Nemo" (in that order) and far ahead of "Cars." That's not a bad position to be in. Although guaranteed at least a nomination in the animated short category, "Lifted" is by far the slightest of the Pixar shorts in recent years. It's very cute and adds up to very little, which wasn't the case with "Boundin'" or "One Man Band," much less "Geri's Game." Maybe it's just b/c I haven't seen the Toy Stories in awhile, but I think Ratatouille has moved into poll position on my Pixar All-time list (you thought it was too long? ), with Finding Nemo slightly behind that and followed by Toy Story (the first one, for sure), then Monsters, Inc. then . . . I don't care after that. One day, I really need for you to explain to me (again) why The Incredibles is so good. I watched it twice trying to grok the thing on the level you seem to enjoy it, and its appeal still eludes me. I think I found it too preachy and not visually awe-inspiring enough, if memory serves. Can Peter O'Toole get an Oscar nomination for a voice? Probably not, but the man gave an honest-to-God real performance in his line readings, and that, along with so many other things, put the movie over the top for me. Just skipped over to Salon and read Stephanie's review which does, indeed, have a more generous take on Anton Ego's monologue. I concur that the monologue ends up with a certain amount of respect for the profession, though only one small corner: He argues that as much as critics love to spew hatred, their most important job is to let people know about the smallest and most ignored of artists, to champion the underdog. That's a noble view of criticism that I don't have a problem with at all. My problem is with the idea that self-hatred and, as his name states, ego, are inherent parts of the critical arsenal, perhaps the most important parts. There's also something about how the worst of attempted art is more worthy than the best of attempted criticism, which I find to be utter bunk. Give me Agee or Kael over Rob Schneider's collected cinematic works any day of the week. But maybe I need to find a new line of work myself? Just a small quibble. Anton Ego's claim was that the good work a critic does is championing the *new*. I guess the new can be small-fry or an underdog, but there is something still pernicious, to me, about the idea of ever-glorifying novelty, over judgment and taste tempered by the knowledge and appreciation of the traditional, the canon, what has come before. As though all those words are bad. Totally agree with you about his wrong-headed condemnation of the most mediocre art being more valuable than the best criticism. The problem with the formula lies in a negation of the act of writing criticism as, simultaneously, one of creation and, on occasion, art. OK, I'll stop commenting on your blog now, since my remarks obviously bore you.